how accurate is "accurate enough" ? Thread: how accurate is "accurate enough" ? I've seen several posters say that the thread they use affects the accuracy of their piecing. How much tolerance do you allow yourself on the "expected/hoped for" finished size of a block or completed item? PS I am also a fan of Mary Ellen Hopkins "personal measurements" - but there are times when it's nice when a " group standard" is a good thing. i want my blocks to finish within 1/16th inch of the measurement. however, some blocks that i've spent a very long time making have been 1/8 too small on some seams. when i realize this, i mark the spots with a pin, and when assembling the quilt, i sew a second seam to strengthen it. of course, this only works if you are pressing the seams to one side. I have learned that you have to be as accurate as possible, the place i find out how accurate I have been always shows when I start sewing rows. My Bernina has a quilting foot that gives me a perfect scant 1/4 inch seam. When ironed, the thread and folded over fabric makes my blocks come out almost perfect every time. This is especially important if I am doing several different blocks that I intend to sash and put together. If you are doing all the same blocks than accuracy is not as important as consistency. If the whole quilt is sewn with the same seam allowance throughout, it should go together well. This is exactly what I do! I believe Mary Ellen Hopkin's idea of PPM's (Private Personal Measurements) for seam allowances only works out ok if you are sewing identically sized squares, and no other shapes within the quilt. It seems to me that for that to work, you need to have the same number of seams in each direction on the quilt. For most patterns, a perfect quarter inch seam allowance is necessary. There's just no getting around it, lol! The seam allowance is an important factor in accuracy , but not the only one. I have a Bernina and there are two 1/4" feet for it, one with a guide and one without. I have them both. Bernina feeds the fabric perfectly and makes a great stitch but is no different from other machines when it comes to perfect 1/4" seams. I have to use a self made guide on my Bernina just like all the other machines I have. I use very thin thread in my bobbin, nothing under 60wt. That makes a big difference. this is how I fix my inaccuracies as well. I agree with this. Sometimes it is just not worth the effort to take everything apart if it is just a tiny bit off. Sometimes my best intentions are to be accurate in my block sizes. But I allow myself some leeway. If it measures to within an 1/8" larger or smaller I am good with that. I try and remember nothing is to be made perfect. To do so is comparing yourself to the creator. I'm would like my blocks to be the correct size - the seam doesn't have to be the 1/4 inch - that is where MH personal measurements come in. I don't worry so much about the final measurement most of the time. I just square them up to the size of the smallest block. If my seams are a tad over and the block comes out a bit smaller, I just make up the difference with the borders if I need it to be a certain size when finished. That is one reason I seldom cut the borders when I cut the blocks out. Just in case I decide to adjust it a bit. No matter how perfect you cut, the variance in the fabric can affect the size too. Some fabrics have more give to them. If it looks good, I'm OK with it. Block size does not bother me as long as the blocks fit together and the points are pointy. I hate cut off points. I am the worst person to talk about accuracy! BUT, as important as accuracy is, the most important is to be consistent. If you consistently sew a 1/4" or 5/8" or whatever, all your pieces are going to fit perfectly. 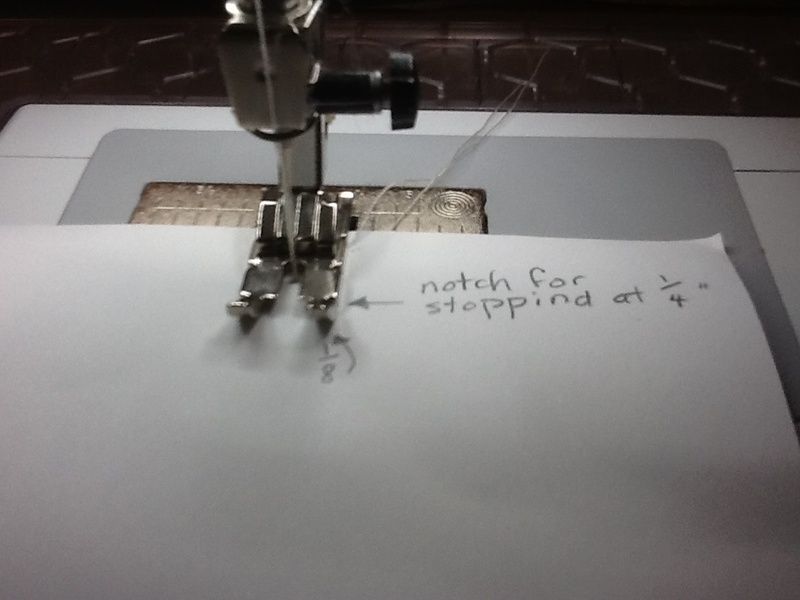 Pick a measurement, whatever it is, edge of your sewing foot for example, and stick with it. The only time this does not work is in a group project. Good luck. Consistency doesn't work if you are sewing shapes together. I have found that I have to maintain the scant quarter inch for them to fit. Same here. I take full advantage of the little bit of stretch in fabric. I haven't had a problem with any quilt not lying flat when it's done so far. As long as it lays flat , and the points aren't chopped off , is the measurement I use. 1. Quilting should be fun! 2. Nobody who gets a quilt from me,comments on the points as they snuggle under the quilt. 3. You can look at my quilting from 20 feet,for 20 seconds,with no glasses on!LOL. My quilting isn't perfect,but it's not too bad,and I'm not a competitive quilter. I like Francie's answer. QUILTING SHOULD BE FUN !!!!! so don't worry about an exact measurement. I don't use a 1/4 " measurement, I use the edge of the pressure foot. That way I am consistent in the quilt and I square off with my rotary cutter anything that's off. The only time this would be an issue is if you were working on a group project, but wait....not all of their's are 1/4" either. It is #37 and I think it is called the Patchwork foot. That foot has a 1/8 inch seam allowance at the front edge as well as the notch lets you know when you are exactly 1/4 inch from the end of the seam. I find this very handy for stopping an exact 1/4 inch from the end when sewing my binding corners. Last edited by Tartan; 07-21-2013 at 09:26 AM. Technically, the seam allowance doesn't matter at all. What matters is the measurement BETWEEN the seams. In my studio, it is either accurate or it is not, there is no 'accurate enough'. I could care less about perfection, but I'm committed to excellence. The Bernina foot, right? Can't quite tell in the pic but would it fit on other machines or does Bernina use a different type of attachment?